While most people are aware of the big-name software titles for the Mac—Microsoft Office, Adobe Photoshop, and the like—there are many great products out there that don’t get the recognition, or even the awareness, they deserve. That’s where we come in. Macworld mines the Web, sifting through inexpensive and lesser-known products from developers big and small to find those products that are worth your time and hard-drive space—the inexpensive software that, once you’ve tried it, you can’t imagine using your Mac without. We call these programs Mac Gems, and we cover them in our “Mac Gems” column in print and on the Mac Gems Weblog here on Macworld.com. If you’ve been watching the site recently, you may have noticed that we’re well into “GemFest 2009,” this year’s installment of our annual celebration of gems, where we feature a new Gem every day instead of the usual two per week. 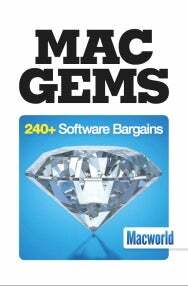 But there’s another reason to celebrate Mac Gems this week: We’ve given Mac Gems the Macworld Superguide treatment. As with the other titles in our Superguide series, the Mac Gems Superguide is a veritable greatest hits of Mac Gems. We’ve gone through every gem we’ve ever covered—a number fast approaching 1,000—checked compatibility with Leopard, hand-picked the best, and compiled them in a fun, informative book. Within its 186 pages, you’ll find over 240 of our all-time favorites, organized by category. For each program, we give you a brief description of what it does, the URL of our full review, and the URL of the developer’s site for downloading. Included are bargain programs for increasing productivity, organizing your files, customizing OS X, and fixing common problems. There are nifty applications for audio editors, graphic designers, students, Internet addicts, and photographers. Some are standalone programs, while others are subtle tweaks that make Mac OS X work the way you wished it did. The one thing they all have in common is that each is a standout product that won’t break the bank. Whether you’re a power user looking to get more control over your system or a Mac beginner searching for add-ons that will make your computing life easier, this collection has something for you. You can purchase and download the PDF version of the Mac Gems Superguide for just $12.95, or you can purchase a print copy for $19.95 or the PDF on a CD-ROM for $12.95. Of course, just because Mac Gems has gotten its own book, we aren’t resting on our laurels. This August will mark the fifth anniversary of the Mac Gems Weblog, and we plan to continue to search for the best in low-cost, high-value Mac software.